CD CHO AGT™ (Advanced Granulation Technology) medium is a protein-free, chemically-defined medium optimized for the growth of Chinese hamster ovary (CHO) cells and expression of recombinant proteins in suspension culture. The AGT™ dry media format is designed to provide increased consistency and productivity across all stages of production from development to commercial manufacturing. CD CHO AGT™ medium contains no proteins or peptide components of animal, plant, or synthetic origin, as well as no undefined lysates or hydrolysates. 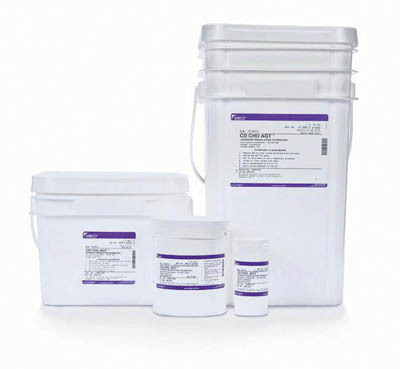 Gibco™ AGT™ media are also available in a liquid format that offers the same performance and formulation as the AGT™ media format. Gibco™ liquid media are manufactured animal origin-free with the same complete, serum-free, protein-free, chemically-defined formulation and performance as their AGT™ media counterparts. Whether it’s a bench-level experiment or large scale biomanufacturing process, we offer specialized formats, packaging, and quality levels specific to your needs. With Gibco™ cGMP Media Custom Services you can put the manufacturing power and years of technical experience of our R&D and Bioproduction Application Specialists to work for you.